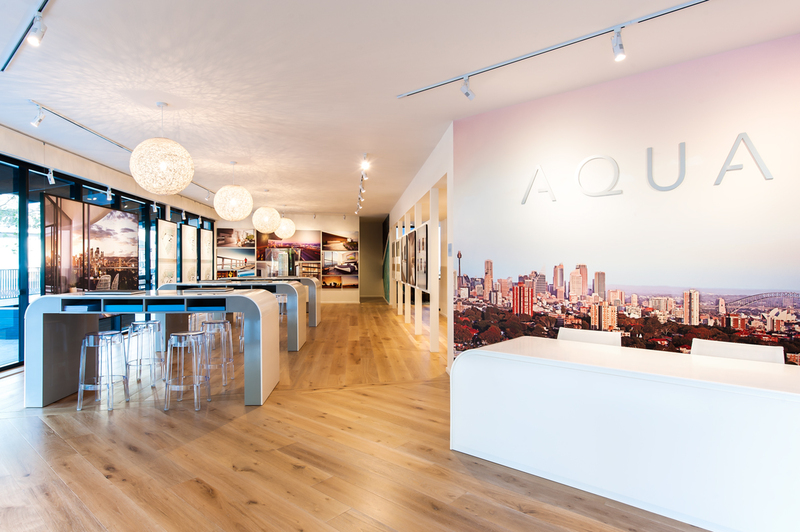 AQUA, Bondi Junctions latest residential development by Leighton Properties. The sleek, sophisticated contemporary design of the development achieves high quality, premium apartments strategically positioned adjacent to Westfield shopping centre and 500 metres from Bondi Junction train and bus interchange. Designed by KANNFINCH and DC8 Studio, the tower has a communal garden podium and a rooftop garden. North east facing apartments have ocean and district views, while those oriented to the Northwest take in the view of the Opera House and Sydney city skyline. Interiors by award-winning Koichi Takada Architects introduce custom-designed joinery from kitchens into living areas, appearing as a sculptured piece of furniture. The team’s light and playful approach takes its inspiration from the bustling hub of the junction, teamed with the proximity to popular Bondi Beach. Kitchen islands are shaped like a surfboard in larger apartments and a ‘gentle wave’ in the smaller apartments both featuring custom Marblo benchtops. Mirrored splashbacks will draw the stunning views inside, and the engineered timber floors will be white or grey-wash.